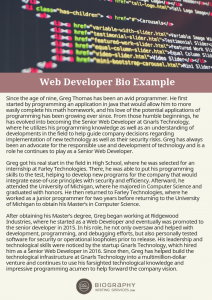 You web developer biography is a summary of your professional career and displays your qualifications in the industry. It is a useful tool for marketing your web development skills and abilities to potential clients or possible employers. It is an effective yet inexpensive tool when used correctly and can help you establish the industry credentials to provide the services you offer. If you read our web developer bio sample, you will see it includes some relevant facts. 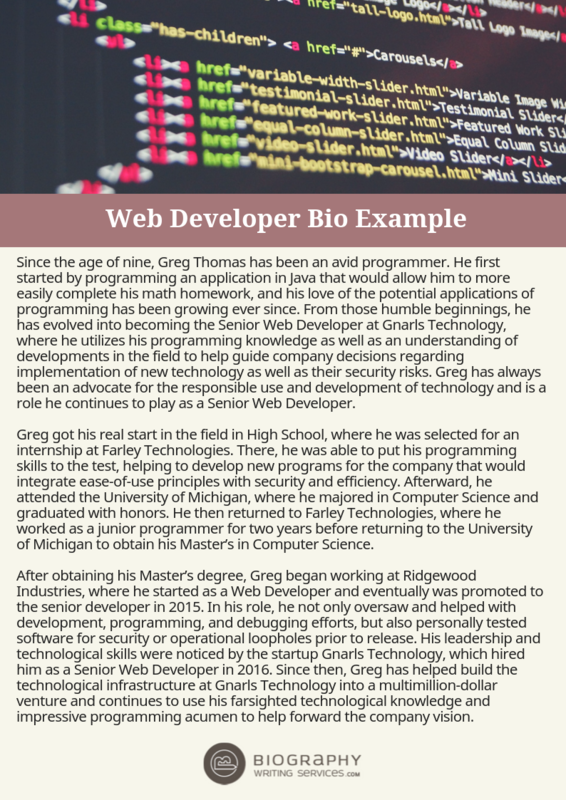 Since a web developer biography will help you establish your expertise in the field, it needs to tell any important information about yourself. It should be brief and describe your career achievements, personal interests relevant to the area and your contact details. Because it can help you boost your company’s growth or bag your dream job, it should be written in a friendly and respectful language. Also, by avoiding any technicalities, you may be able to connect with a broader audience. When writing your web developer bio, always remember its purpose is to position yourself as a strong candidate and an expert in the field. Keeping it that in mind will help you write an outstanding biography. A good bio will also help you stand out from the crowd. Thus, ensuring you write a perfect one is vital. Writing an effective professional biography begins with knowing its purpose and who the audience will be. In most cases, the purpose will be to find new clients or to attract the attention and interest of a potential employer. This means the audience will be either an employer looking for a particular set of skills or potential clients who need the services and skills you offer. First of all, you will need to gather all the relevant information. Make sure you have your academic accomplishments, job experience, personal interests relevant to the field, own projects, and your contact details. Once you have them, start your bio by introducing yourself. You should briefly tell your name, job position, and your area of interest. Continue by writing about your job experience. Bear in mind this is not a resume, so you should briefly include the most relevant positions you have had. Shortly include your academic achievements. If you are a self taught web developer, you will need to include any relevant online courses you may have read and the personal project you have worked on. Also, for a self-taught web developer biography, it is important to highlight your discipline and dedication for the job. As this is what made you learn by yourself how to be a web developer. The professional biography should be fairly brief. Don’t exceed one page in length and in many cases it may be shorter. To make it easy for the reader to scan your bio, use short paragraphs. Write the biography in the third person using a narrative style. Use language that is easy to understand and avoid technical jargon as much as possible. Your web development biography should be brief, but it also needs to cover all the relevant information about your position. It should also include the programs you work with and your proficiency level. If you are going to write it for a general audience, avoid using technical language as this might confuse the reader. However, if you are writing it to include it in your resume, do use technicalities. This will help you position yourself as an expert and show your knowledge of the field. Always write it in the third person. Your bio should be written as if someone else is presenting you. Use friendly and respectful language. Probably, your closest friends will not be judging your bio, so make sure you always treat the reader with respect. Write your web development bio in short paragraphs, as this will help the reader scan your text. Introduction. Provide your name and what you do. If you have an area of specialization or a particular time of customer you focus to include that. Awards and affiliations. Any awards or special recognition received should be mentioned if relevant. Include any industry related organizations you are a member of. It isn’t always easy to determine exactly what to include or how to present it in your biography. Reviewing a web developer bio example can be helpful, before working on your own. If you can’t learn what you want from an example of a biography, one alternative is to have our service write one for you. 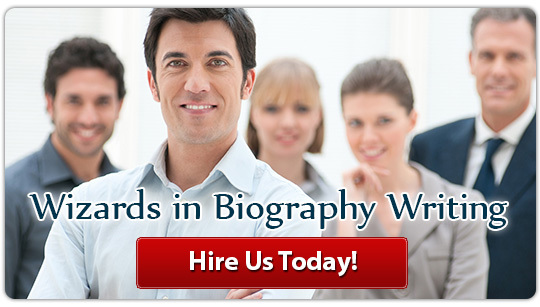 We specialize in writing professional biographies of all types, for example, a web developer bio or a graphic designer bio. Contact us for an effective web developer bio written specifically for you and designed to achieve the purpose you intend it to!